Dr. Doc is a cool top-down action brainteaser from Fallen Angel Industries. Although the game was coded in a hurry for a Klik competition, and as a result is missing music and proper menus, fun gameplay more than makes up for these slightly unprofessional factors. 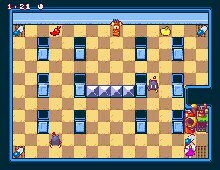 Each of the game's 36 levels is a small room which contains a number of enemies, some fruits, and a machine. Your goal, of course, is to get rid of enemies in each room by making juice (!) that matches the enemy's color from fruits in the room. Some enemy creatures are juice resistant; the only way to kill them is magic pills (but of course). Colorful graphics and a fun mix between puzzles and action makes this another neat little underdog that will please every fan of reflex-based puzzlers. Two thumbs up! If you like this game, try: Stackopolis, Bananarama, Live Wire!